From time to time patch repairs are done to units which can change their appearance from what is normally expected. 377124 has been painted in a non-standard yellow below its secondman's cab window. 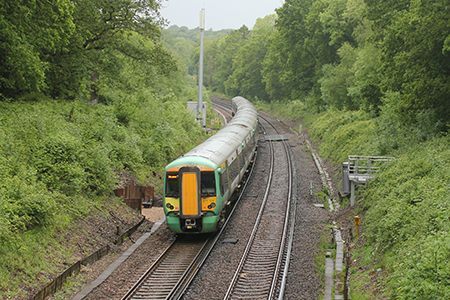 It was captured by Ian Buck on 26th May 2014 at Balcombe whilst forming the rear of a Littlehampton/Eastbourne to Victoria service.